Ninjask is a Bug/Flying type Pokémon introduced in Generation 3. It is known as the Ninja Pokémon . The effectiveness of each type on Ninjask. In Generations 3-4, Ninjask has a base experience yield of 155. If NINJASK is not trained properly, it will refuse to obey the TRAINER and cry loudly continuously. Because of this quality, this POKéMON is said to be one that puts the TRAINER’s abilities to the test. Its cry leaves a lasting headache if heard for too long. It moves so quickly that it is almost invisible. Ninjask learns the following moves in Pokémon Ultra Sun & Ultra Moon at the levels specified. Ninjask learns the following moves when it evolves in Pokémon Ultra Sun & Ultra Moon (regardless of level). 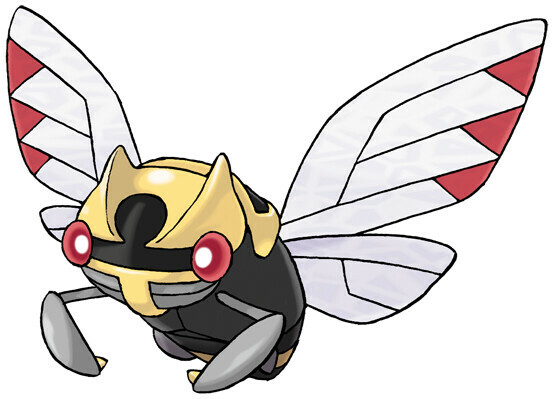 Ninjask learns the following moves via breeding in Pokémon Ultra Sun & Ultra Moon. Details and compatible parents can be found on the Ninjask egg moves page. These moves can only be learned in Pokémon Ultra Sun & Ultra Moon by a previous evolution of Ninjask. Check the respective Pokédex for the exact details. Ninjask can only learn these moves in previous generations. It must be taught the moves in the appropriate game and then transferred to Pokémon Ultra Sun & Ultra Moon. Ninjask learns the following moves in Pokémon Sun & Moon at the levels specified. Ninjask learns the following moves when it evolves in Pokémon Sun & Moon (regardless of level). Ninjask learns the following moves via breeding in Pokémon Sun & Moon. Details and compatible parents can be found on the Ninjask egg moves page. These moves can only be learned in Pokémon Sun & Moon by a previous evolution of Ninjask. Check the respective Pokédex for the exact details. Ninjask can only learn these moves in previous generations. It must be taught the moves in the appropriate game and then transferred to Pokémon Sun & Moon. What is a good moveset for Ninjask? How can I get my pokemon back from the pokewalker? How does Nincada lose so much defense after evolving? What so Good about Ninjask and Lapras?